Since the front seats need to fairly regularly get removed and reinstalled during construction and for maintenance, many builders come up with a way to quickly do that. I’m doing the same thing although my method is slightly different from the others since Velocity cme up with new seat rails some time ago. I document the modifications and installation on this page. 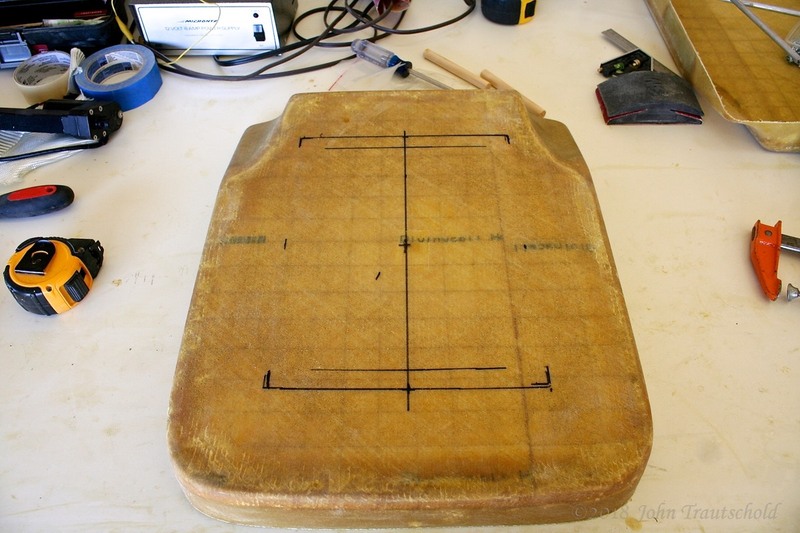 The first step in building the seats is marking the bottom seat pan for attaching the rails. 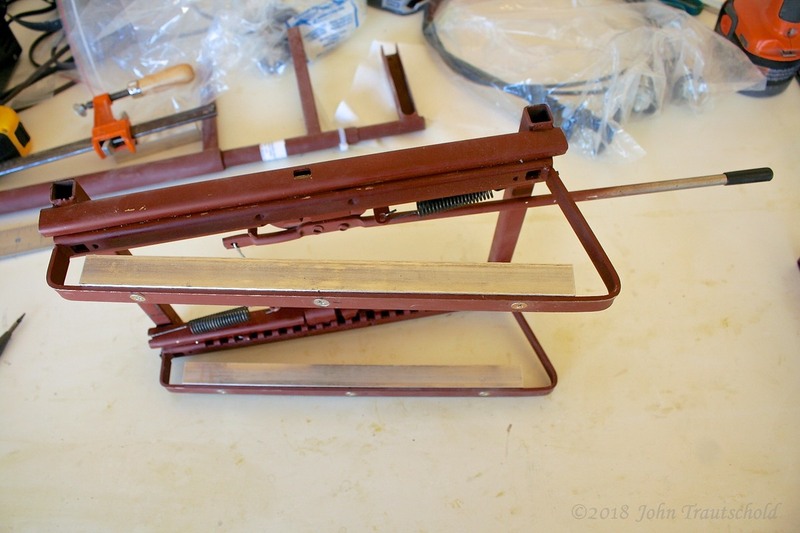 I’ve done that here, but I may have to adjust this somewhat due to the rail modifications that I made. This is the bottom pan for one of the front seats. I'm laying out the location for the seat rail assembly. 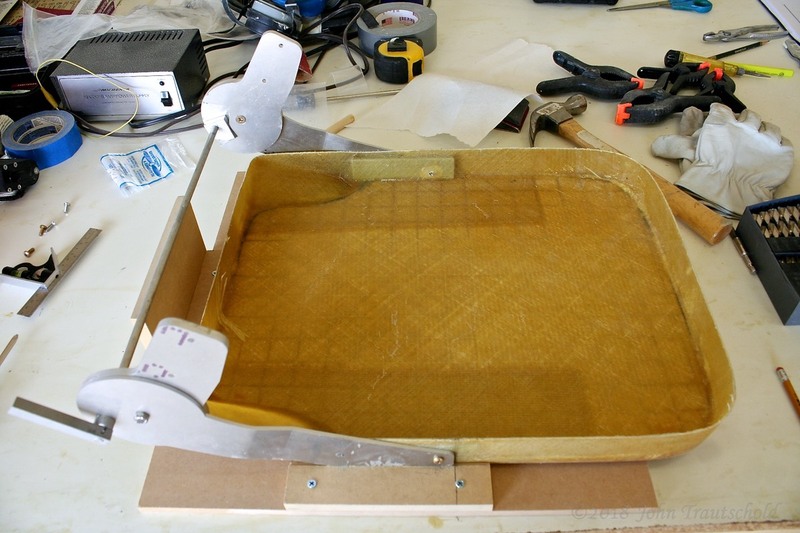 Once the bottom pans are marked, it’s time to install the seat adjuster mechanism. This turned out to be more of a pain than I thought it would. 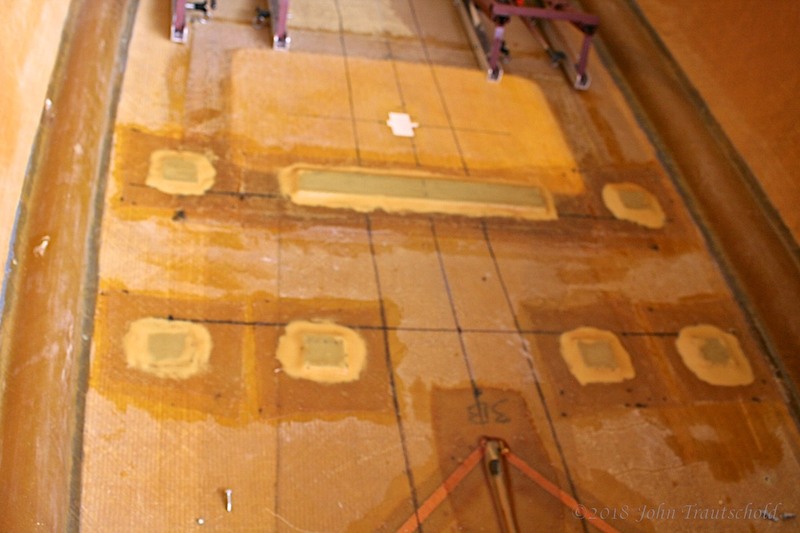 The factory pre-installed hardpoints for mounting the adjuster but there are no reference marks for aligning it. I ended up making a template of sorts to hold everything in place so that I could accurately mark and drill the mounting holes. This adjustment mechanism permits the backside of the front seat to be adjusted and moved forward for access to the rear seats. And here's another view of the adjustor as it's being installed. Once the adjustor was mounted to the bottom seat pans, mounting the seat backs was fairly straight forward. Here's a photo of one of the completed front seats. All it needs is upholstery! 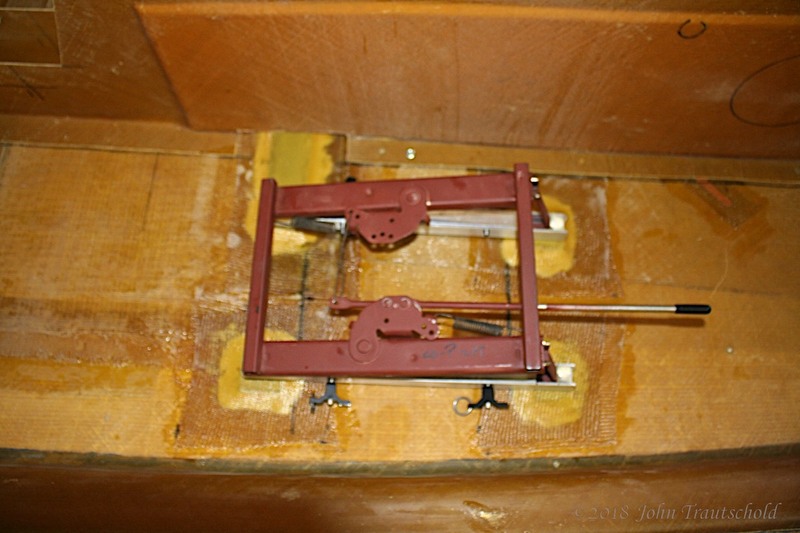 And here's a closeup photo of the back pan attached to the adjustment mechanism. Once that was finished it was time to move on to the seat rail modifications. I’ll tell you, Aircraft Spruce sure likes builders because we spend a lot of money on extra stuff for our kits! The modification is fairly simple. I added some 3/4” square 6063 aluminum to the actual rails. I drilled and tapped the aluminum for bolting that aluminum to the rails. I'm modifying the seat rail installation to make the front seats easier to install and remove. 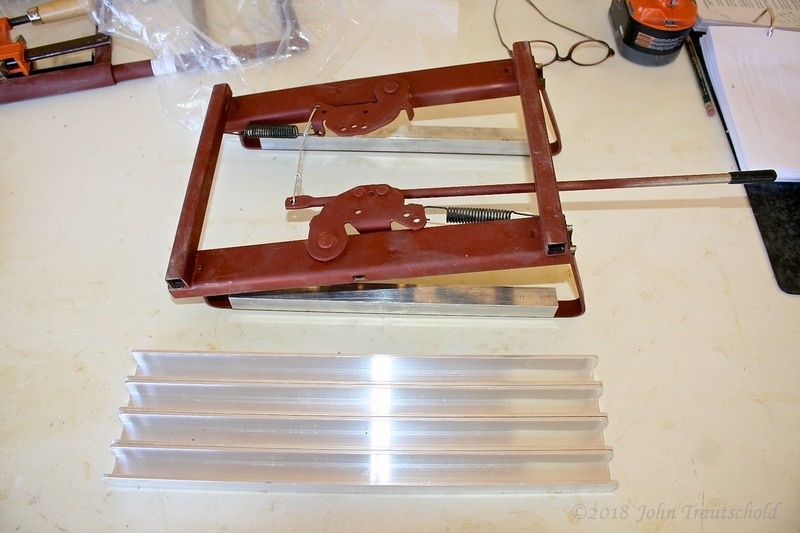 Here's another view of the first step in the modification - installing 3/4" square aluminum. Once that was finished, I cut and prepared the aluminum u-channel. 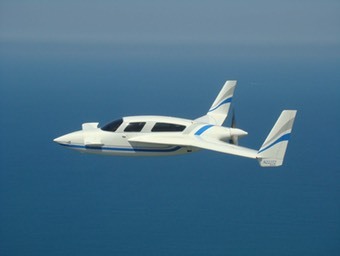 Eventually the u-channel gets mounted to the hardpoints in the fuselage. (Yet to be installed because I’m waiting for a modification from the factory to get around one of the hardpoints being right over the speed brake hinges!) In the meantime, I’m test fitting everything to make sure it works properly. 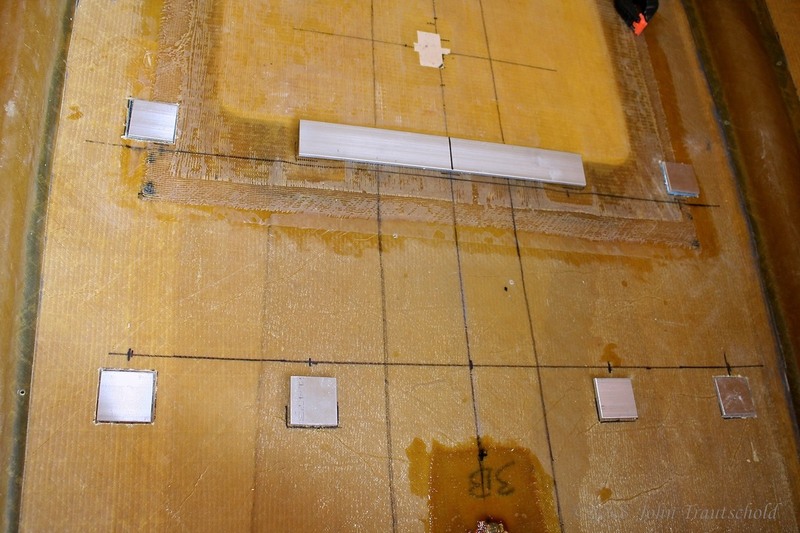 Here I'm showing the four u-channel aluminum pieces that eventually gets mounted to the floor. The rails then get inserted into these. And here's the finished product, looking from the bottom of the adjustors. You can see the quick release pins installed through the u-channel and 3/4" aluminum bars. A closeup view of the quick release pins. Those darn quick release pins cost $20 a piece from Aircraft Spruce! Yikes! But they are good and sturdy so I guess it’s worth it! I finally received the “missing” large hard point - that’s the long piece in the photo below. 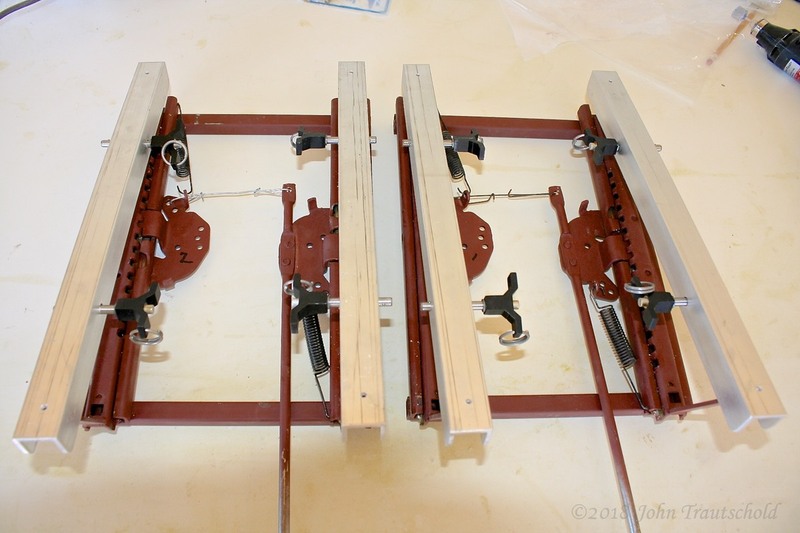 The kit comes with eight of the smaller hard points, but due to the hinge locations for the speed brake, the smaller hard points can’t be installed since they are directly over the hinge.The longer hard point can easily be epoxied into place in between the two speed brake hinges and works nicely. Also notice that all of the hard points are located away from the original location markings. That’s because of my modification for quick release seat rails. They are longer than the standard mount points so I had to move the hard points to accommodate that change. It really doesn't matter since the seats end up in the same place anyway. Front seat hard point locations and preparation. I also ran into an interesting situation. 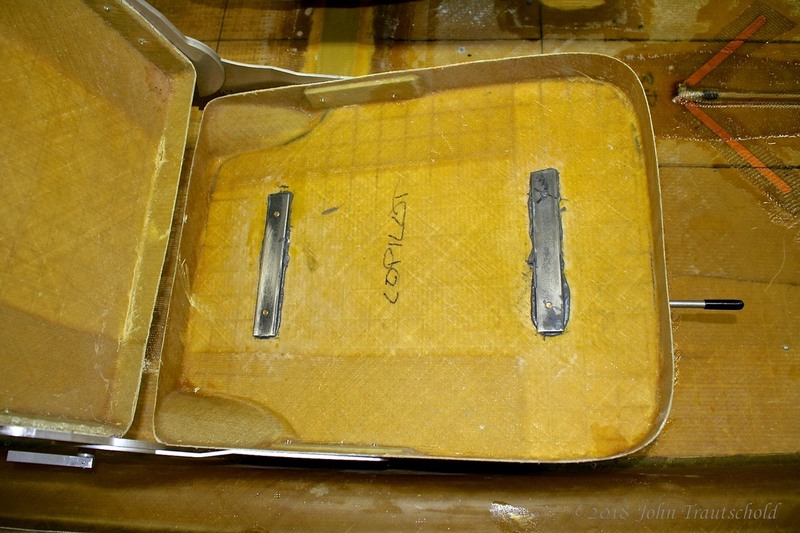 The seat adjusters, as they came from the factory, weren’t level! I compensated for that with the hard points, which started out level, but ended up not being level (you can see some blue foam shims under some of them). As they say, two negatives make a positive, and in the end, the seats ended up being about as level as possible. Here are the hard points after being covered in two layers of BID for strengthening. The lighter epoxy around the edges of the hard points help to create a transition so that the BID lays up smoothly around the edges. 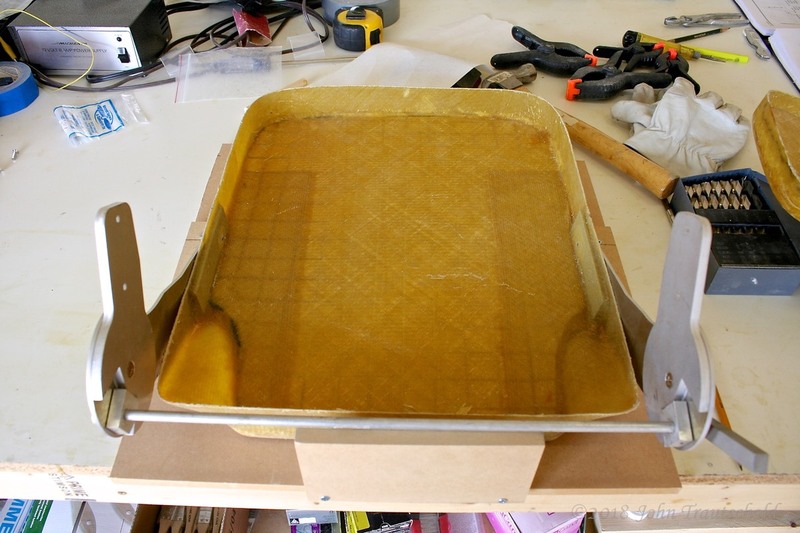 It’s the same EZ-poxy but with Microballoons added to make the mixture thicker and easier to spread. 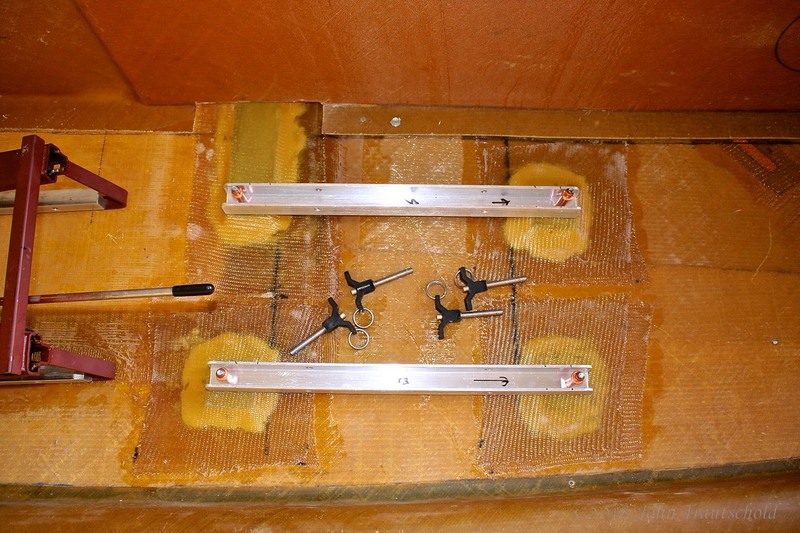 The hard points are epoxied into place and cover with two layers of BID. Sorry about the focus! It turns out that my camera battery was dying and I didn’t notice it so it was having trouble focussing. Oops! 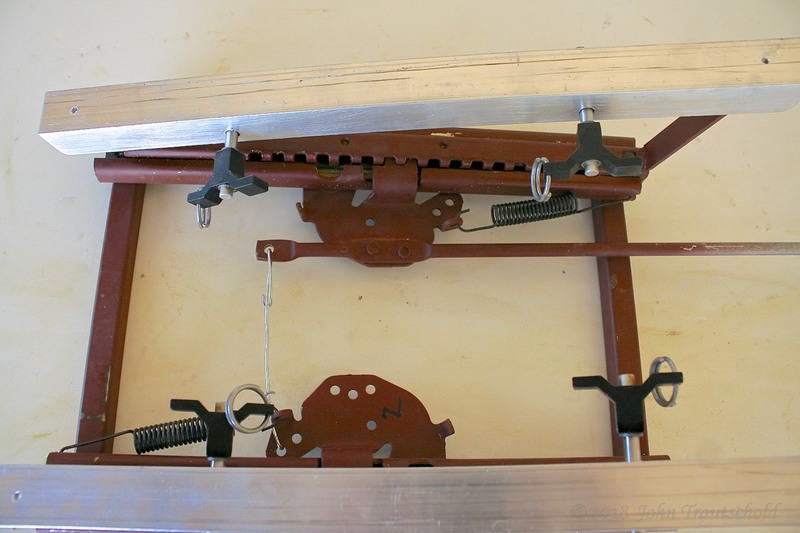 My modification, the quick release seat rails, are being test fit in the photo below. Installing my seat rail modification. My camera battery was dying - that's why the focus issue yet again. 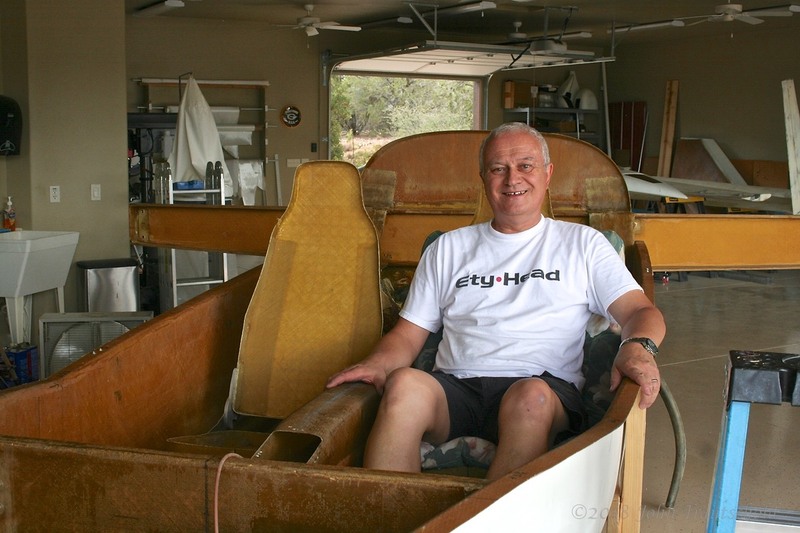 Here I'm test fitting the seat adjustment mechanism in the seat rails. 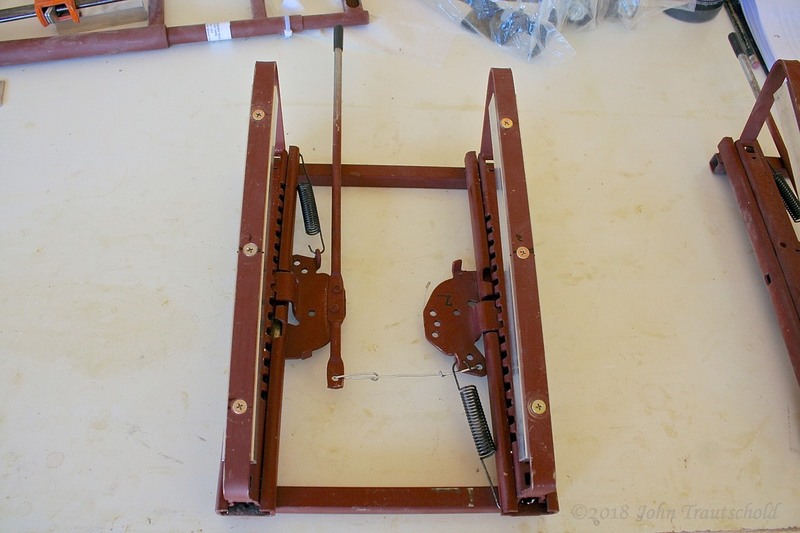 Another recommendation from some of my Velocity construction buddies is to install hard points in the seat bottoms to make it easier to disconnect the seat from the adjustment mechanism. Here’s a photo of the hardpoint installed in the co-pilot’s seat bottom. I didn’t see a need to cover these hard points with BID since I used structural epoxy to glue them into place. Plus, the bolt force is pulling down which helps to lock them into place. Seats need to come out frequently for various inspections and such so it makes sense to me to do this extra work to make removing the seats easier. If you scoll up to the top of this page, you’ll notice that I pre-marked the location for the seat adjusters on the bottom of the seat pans. Once I got everything aligned I drilled through the hard points and into the seat adjusters. 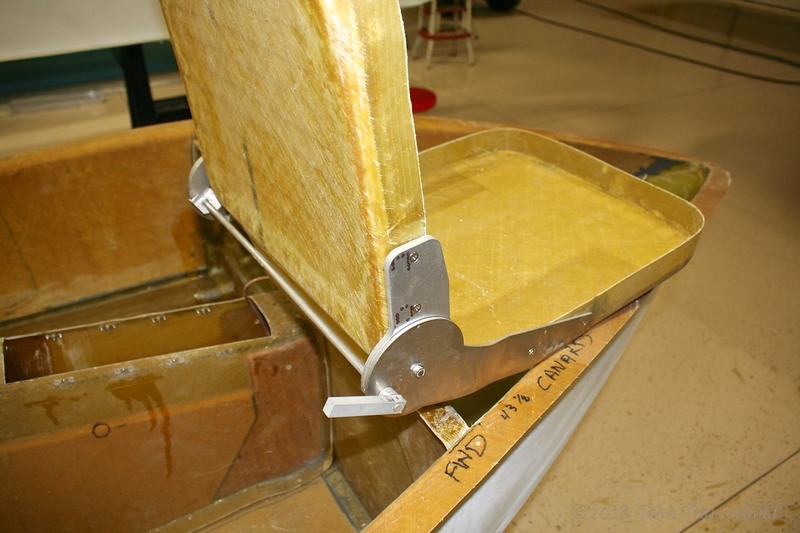 The hard points are tapped so the bolts get inserted from the bottom of the seat adjuster rail and into the hard point. I also used some lock washer on the bolts to help hold everything in place. Seat bottom hard points for easier removal of seat from adjustment mechanism. And here both seats are installed in the fuselage! And of course, now that I’ve got something to sit in, I need to test it out. It’s getting closer to being an airplane!!! Of course, I just have to sit in the pilot's seat to test it out! 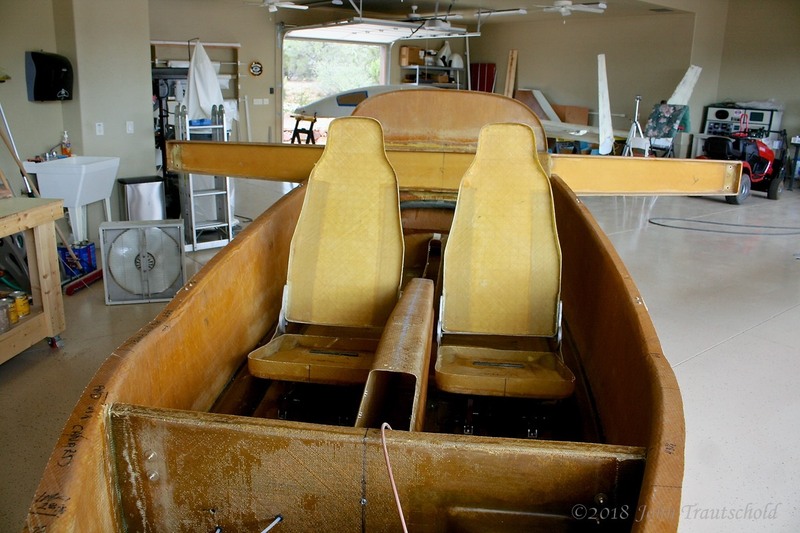 Now that the seats are finished (they need to come back out for installation of the keel) I can get to work on that keel, which comes up next. One reason for the delay in working on the keel is that I needed to make some openings in the base of the keel for that long hard point. 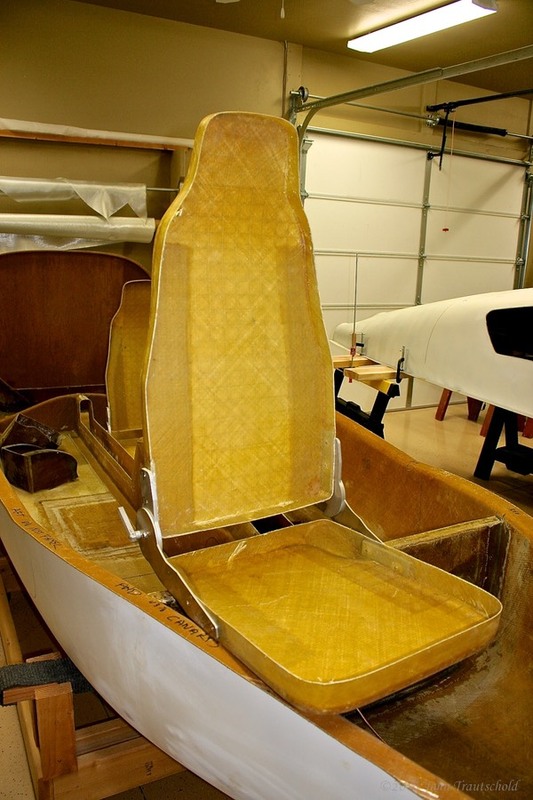 Click here for keel construction!